Think back to the last time you had dinner out with a group of friends. Now reflect on your last dinner at a restaurant that serves food with origins in another country. I hope you’re smiling, because what I experienced at dinner tonight had me laughing out loud, a capital LOL. My sweetheart’s bosses invited several employees out to dinner and I was asked to join them. I arrived at the Mexican restaurant before everyone else, so I went in to get a table for six. I sent a text indicating where the table was located, and got a text back saying there would now be NINE people. I spoke with the server indicating that I would need a larger table. She didn’t speak English very well, so the manager translated my request. When the rest of the party arrived, the same kind server came and took our orders. Again she struggled with understanding our words so we pointed at the menu to explain our requests. Everyone was patient as she worked to understand what we were saying. Keep in mind, the table had people from AL, KY, NY and TN giving the server a variety of accents to interpret. It seems that our efforts to communicate were unsuccessful, because when dinner arrived…well let’s just say it was interesting. My meal of one plate of chicken, rice, and cheese with a side of queso and an extra empty plate (so I could split my dinner) arrived as TWO chicken and rice plates, one swimming in queso. Three beef tacos arrived as a cheese quesadilla, chicken chimichanga, and a small chicken taco salad with no lettuce. Two guests had to reorder, because the kitchen didn’t prepare their meal. They ordered ONE beef fajita meal and an extra plate so they could share. Yep, you guessed it. TWO hot, steaming plates of fajitas arrived minutes later. Now I work in an environment where many languages are spoken and it is my responsibility to help my guests understand what I am saying. Tonight, all off my attempts to clearly communicate fell flat. I felt really bad for the server until I realized that she had no idea of the communication errors. As the dinner progressed, the kind server worked hard to fill our requests for additional beverages and extra plates. I couldn’t help but laugh as the server smiled when she delivered her interpretation of what we had requested. One woman asked for a to-go cup of sweet tea and was delivered a to-go box for food. At that point, all of my polite table manners left, and I laughed so hard that food almost came out my nose. I even wondered to myself if the server was just messing with us, if so, she got us good. Thankfully all of the people at the table accepted their incorrect orders in good humor. When the bill arrived, the table discussed if we should pay for what was served or what we had ordered. Pay for one plate of fajitas or two? That is a big difference in the bill and the tip. I thought back over the funny meal and laughed to myself as I imagined the woman drinking her sweet tea from a to-go food box. I have eaten dinners out with many people over my lifetime. Dinner with this group of people made my heart warm. No one complained to the manager or berated the server. They enjoyed each other’s company, laughed at the comedy of errors, and ate the tasty food. Tinkering With Success is about becoming a better version of oneself. Tonight I saw kindness, understanding, and humor when the guests honestly had a reason to be upset. Laughter among friends makes even the most frustrating situations an enjoyable experience. So the next time you are faced with a language barrier, look for the humor, and then find a way to communicate. Kindness always wins. My last blog post was on December 31, 2017. In that post, I stated “With the new year just around the corner, I suppose I should set a new goal. So for 2018, I will focus on getting stronger.” I went on to explain that I wanted to lift weights to get physically stronger. Unfortunately, the Universe decided to test my strength in other areas. Shortly after the New Year, the organization where I work began to go through some difficult changes, necessary, but still difficult nonetheless. There was a tightening of budgets, a reduction in force, and reorganization of departments. All things that have been commonly discussed in the news for many types of companies. I am pretty good at adjusting to change. I appreciate opportunities to grow and learn new things. However, this most recent round of professional changes were some of the hardest that I have dealt with in recent years. Thankfully, I am still employed, but witnessing my organization’s growing pains was a learning experience that I don’t care to go through again any time soon. As the weeks began to tick by in January, I kept thinking that I needed to write a blog post. Actually, I wanted to write a blog post. While swimming, I would search for topics to write about, searching for some humorous things that I could share, but what I found was that I had lost my writer’s voice. I kept waiting for my voice to reappear. January passed, then February, March, April, May, June and still no voice. Well after my adventures from last evening, I found my voice. Sit back, relax, and get ready to chuckle. In 2015 I rode a bicycle regularly, but in early 2016 I broke my ankle and found a place where I could go swimming instead of riding my bike. Last night I decided that I would dust off my bike and take it for a spin. My sweetheart, being a supportive partner, put air in the tires and made sure that the bike was mechanically sound. I put on my helmet, grabbed bottled water and my cell phone, and went out to the garage to go for a ride. I walked up to the bike, raised my leg up to get it over the seat, and STOPPED. My leg muscles were so tight that I couldn’t get my leg over the seat. I tried again to no avail. My sweetheart was watching and said try it from the other side. So I changed sides of the bike, lifted my leg up with confidence, and stopped. That wasn’t working either. It’s a girl’s bike, so I decided to put my leg through the lower section, except that is where I had my bottled water and cell phone mounted. At this point I was getting frustrated. I was GOING to RIDE that darn BIKE. My sweetheart held onto the handle bars (he gets an award for not bursting out in laugher), I swung my left leg up and over the seat it went. There I stood with my cold water bottle sweating on my shorts, so I hopped up on the seat and began peddling out the driveway and into the cul-de-sac. I was as unsteady as a new born foal. I wobbled and teetered for about a minute, before I got my balance. I can only imagine what the neighbors thought. After I got comfortable, I took off riding through the neighborhood, thinking “I’ve got this!” I chose a path that was relatively flat, peddling in first gear. I was riding my purple girl’s bike, feeling happy, going from street to street, getting further from home…and then the fatigue hit. I have been swimming and lifting weights regularly for two years, but I had NOT been riding a bike. Right then and there I made the decision to just stop riding, to call home and ask someone to come pick me up with the truck. The only problem was that if I stopped the bike to grab my phone, how was I going to get my leg over the seat to get off of it? Now I know you are sitting there thinking, “Just lay the bike on the ground.” Well it was 89 degrees, I was hot, tired, and at this point very cranky, so I was not able to problem solve. My only option (that I could come up with at the time) was to keep peddling. I arrived home about 20 minutes later. As I pulled into the driveway, there stood my sweetheart. I yelled for him to come help me. He arrived just as I stopped in front of the garage. He grabbed the handle bars so that I could easily dismount. Or so we both thought. My legs were so tired that the only way off the bike was to lay it on the ground. I stepped over the downed bike, climbed the three very large steps (yea, normal size steps, but they felt big at the time) up into the house, and collapsed on the sofa. So here I sit, about 20 hours removed from my genius idea to go for a bike ride, and all I can say is “WHAT was I THINKING?” That effort was truly a comedy of errors from beginning to end, but I did it. And in the spirit of Tinkering With Success, I have decided that I WILL ride my purple bike again tonight. Since I’ve decided to “get back on the bike”, what is something that you’ve been meaning to do but have been putting off? Make a plan and give it a try. However, be sure to stretch first! It’s Official, I am Normal. In the spirit of Tinkering With Success, I thought it appropriate to do a quick year end review. In 2017, I didn’t break any bones. Over the course of 2016, I broke my right ankle and later in the year I broke my left foot. The doctors performed many tests, but could find no medical reason why I was breaking bones. They just broke. My goal for 2017 was to do everything that I could to increase my bone density. So for 52 weeks, I lifted weights and swam laps. My bone density report went from “normal for a woman of my age” in 2016 to just plain normal in 2017. I call that a WIN. With the new year right around the corner, I need to set a new goal. So for 2018, I will focus on getting stronger. Perhaps I’ll add in some free weights to my workout routine. I could certainly use a little more upper body strength. Getting older comes with many challenges, but I’m going to fight to maintain my health. What would you like to achieve in 2018? Is there an area in your life where you would like to grow, improve, or begin something new? I’m not suggesting that you set a new year’s resolution, because those don’t typically last. However you COULD choose one commitment for 2018 and see where it takes you. One Saturday morning, my family had gone out for the day leaving me and the dog home to enjoy the peace and quiet. We both had breakfast, watched TV together, and then I went to grab a long, relaxing, uninterrupted shower. Work had been very busy that week. Big projects to complete, papers to grade, issues to be resolved. But it was OK, because I knew that SATURDAY would be MY day to relax and shake off stress. I love my family and enjoy spending time with them, but I was also looking forward to some peace and quiet. Perhaps you, too, can relate. If you work in a job that involves other people, work sometimes just gets messy and leads to stress that can follow you out the door at the end of the day. Going home can add a different level of interaction that over time has you craving a moment of silence. Well Saturday was MY moment of silence. In preparation for my relaxing shower, I grabbed my fuzzy robe, hung it up in the bathroom, and then placed several bottles of lotions and potions on the counter. The music was turned on low and I got the shower temperature just right. Homemade spa shower, here I come. I stood for a while just enjoying the warm water. I soaped up my hair with the special shampoo that would give my hair that “lovely glow and fresh scent.” Just as I had worked up a good lather, the dog barked. Now if you are a dog owner, or have ever visited someone who owns a dog, you know that the dog bark has different meanings. There’s the “come play with me” bark. The “I have to go outside” bark. The “I’m barking in my sleep” bark. Then there’s the “someone is breaking into the house and I’m going to rip them from limb to limb” bark. You guessed it. The dog used her “someone is breaking into the house” bark. As a dog owner, that bark usually makes the hair on the back of your neck stand up and your adrenaline begins to flow. So there I stood in the shower, head soaped up with the special “Saturday by myself” shampoo, knowing that someone was in the house. I knew that it wasn’t anyone from the family, because that bark is more like “hey, you’re home!” so I sprang into self-protection mode. I thought, what do I have in the bathroom that I could use to fight off an intruder? Then I remembered in a movie, someone spayed hairspray in the intruders eyes to save themselves. No problem. I can do that. I peeked my soapy head out from behind the curtain only to see that there was NO hairspray. Oh, that’s right. I had used it up the day before and didn’t replace it. No problem. There must be some other aerosol can in the bathroom. I quickly thought through all of the options. Nope nothing. Darn the 1970’s environmentalists. Aerosol cans kill the ozone layer, so now we have pump bottles. I haven’t seen the pump bottle, intruder-battling technique in a movie. Keep in mind that all of those thoughts took place in about a minute. Given no true means to battle an intruder, I rinsed off, wrapped my hair in a bath towel, and donned my fluffy robe. Stepping out of the shower, I put my hand on the door knob and quietly opened the door. I was fully prepared to face down the intruder in MY home. As the door opened, I quickly glanced around the room looking for said intruder. What did I find? The dog……….sound asleep on the bed. Yep, her alarming, “I’m going to rip you from limb to limb” bark must have been a false alarm. She just forgot to tell her owner that critical, lifesaving fact. As you can imagine, I wanted to yell at her for scaring the hell out of me during my SATURDAY shower, but I couldn’t do it. She looked sooooo cute curled up in a ball, sound asleep. That may seem like a strange reaction to a scary event, but I am that crazy dog person who thinks her dog is just the cutest thing ever, especially when she is sleeping. So I sat down on the bed next to her and thought to myself, what is the Tinkering With Success moment here? Well the answers are: 1. to never run out of hairspray in the bathroom and 2. keep my cell phone handy. I’m glad that I have a dog who would protect me from intruders. However, the next time I decide to take a relaxing spa shower during a quiet Saturday, I’ll have to loop the dog in on my plans. Or better yet, I could take her to the kennel for her own spa day. Hmmm, I think I’ll call and book THAT kennel appointment right now. Gifts and Talents: Top Secret or Worthy of Sharing? Have you ever thought about the talents or gifts that make you unique? In case you’re sitting there scratching your head thinking “what is this woman asking me?” I’m talking about those things that come naturally to you. Cooking, fixing a car, playing an instrument, growing plants, or solving word puzzles are examples of some things that people do with ease. For those of you who know me personally, cooking isn’t one of my gifts…but you get the idea. Now what happens to those gifts when you can no longer do them? When you become frail or even pass away? Someone who I loved dearly passed away unexpectedly and took those unique talents and gifts with her. In addition to grief, I was left to find a way to imitate/recreate how she did the things that made me smile. In this particular instance, she took with her those treasured recipes and craft secrets that had been passed down from family members. Recently I asked someone for the recipe of a tasty dish. The person said “There is no recipe, I just make it.” I just shook my head and walked away, because someday that treasured recipe will be gone and no one will be able to recreate it. I think that is a terrible shame. We already live in a disposable society, why do we treat our talents and gifts as disposable too? What if we each set aside a little time to share what comes naturally to us with someone who could benefit? If you are good with cars, find someone who doesn’t have that talent and teach them how to change a tire, check oil levels and tire pressures. If there is a treasured family recipe, take the time to measure when you are preparing that dish and write it down, including the steps for assembling it. As with many things that we do naturally, a list of the parts, pieces, or ingredients is helpful, but how they are assembled is what creates the treasured item. I can imaging that some readers are thinking “That’s a great idea but who has that kind of time? I’m working 50-hours a week, raising children, going to night school.” Scheduling time to do what I am talking about will take some effort, but think about how you could make a difference in the life of someone else. I’m not talking strangers, although that WOULD be cool too, just look at your inner circle. 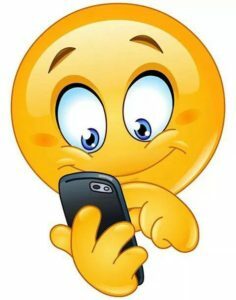 Who has showed interest in something you have been doing? Let them watch, then teach them a few things each time they watch. Tinkering With Success is about becoming a better version of oneself. Sharing something that comes naturally to you will help someone else grow. Then, when you CAN’T anymore, someone else can keep your gifts and talents alive. They may change the method a bit, but through their efforts you live on. Now that’s what I call a unique gift. Pass it on. In high school, my French teacher required the class to read The Little Prince, by Antoine de Saint-Exupéry. I thought “no problem, I like to read.” Then she said we would be reading Le Petit Prince IN FRENCH! I can tell you that my teenage self was NOT happy. There is a part in the story where the little prince describes seeing 43 sunsets in one day. I grew up on a lake where sunsets are so beautiful. The thought of seeing 43 sunsets in one day just seemed magical to me. Now when I am watching a beautiful sunset, I often reflect back on that book and wish that I could just move my chair a few steps to see it again. Recently I had the opportunity to experience something nearly as fascinating…a total solar eclipse. The eclipse was big news in this part of the country. Classes were cancelled, people took sick days, lunch hours were rearranged…all so that people could see the eclipse. Well I’m here to tell you that an eclipse is no big deal. When I was in grade school, we made pinhole viewers and watched the eclipse at school. It was A LOT of waiting for one moment of WOW. Needless to say, I thought that all of the publicity for a moment of WOW was overkill. I felt that way UNTIL August 21, 2017 when I had my own personal “sunset” experience. The day was sunny, minimal cloud cover, everyone was excited to see what was billed as a “once in a lifetime” event. As the moon moved to cover the sun, the light began to diminish, the peepers began to sing, and the air had a strange energy. It was a Monday and I was experiencing twilight at 1:25 in the afternoon. Totality only lasted a couple of minutes. Afterwards the peepers stopped singing, the sun began to shine and the energy in the air dissipated. I am so glad that I followed the crowd and went outside to watch the total solar eclipse. Seeing it with grownup eyes WAS magical. And when you think about it, I saw the sun “set” twice that day. I had an experience similar to Le Petit Prince. You know, I really HAD considered just working through the eclipse. I mean, I had already seen it ONCE before. What’s the big deal? “I had work to do!” Thankfully, my curiosity won out. It’s interesting how a story that I fell in love with as a teenager stuck with me through adulthood. I’m also thankful that I have a curious nature. Tinkering With Success is about learning and growing. In this case it allowed me to experience two “sunsets” in one day. The other morning, I went swimming, as I do most week days. What made this day different is that I took a six-year-old with me. I’m sure that sounds a bit harsh, especially when talking to a six-year-old, except when the six-year-old was ME! Yep, all that whining was going on in MY head as I was swimming laps. How many times has your “six-year-old” shown up to try and distract you from what is really important? Think about that Saturday morning when you woke up with a long list of things to do. The next thing you know, it’s dinner time and you’ve spent the day doing fun stuff. It was a great day, but you still have that to-do list. I don’t know about you, but my six-year-old gets her way a lot more often ALWAYS wins. The problem is that later I feel guilty about not doing what I said I would do. Sometimes I’m letting myself down. Sometimes, my childish decisions let other people down. “Adulting” is hard work. While Tinkering With Success, my goal for the next month is to focus on doing the important tasks first and then having fun. Of course, balance in all things. If a unique opportunity presents itself, I won’t pass it up so that I can wash my dishes. On the other hand, completing adult tasks must trump fun, especially if the task is a commitment that I made to myself or someone else. Think about your life. Productive adult vs. whining “six-year-old”. May the best person win….at the right time. It has taken me a while to write a new blog, because I haven’t done anything weird (shocking, right?) nor have I experienced any weirdness. Some of that is because it is summertime, when my home and work lives become much more chill. I love the time from Commencement to the first day the fall semester. It allows me to slow down a bit, enjoy blue sky, read for fun, and hang out with the people and pets whom I love. I’m still swimming every weekday. This time of year, when I leave the house at 4:40 am, daybreak is near. The other morning, I watched the sun rise as I was swimming. Every other lap I got a quick look out the window and on one of those laps the sky was painted with the most beautiful pinks, yellows and orange colors that I have seen in a long time. I really didn’t want to swim that morning, but that amazing sunrise was my reward for getting out of bed. I’ve been at this early morning swimming routine for nearly a year. There are days when I just want to give it up, but I keep going. I finally found a way of exercising that I love. I have also found a community of like-minded people who model this healthy journey. Skipping a workout is hard to do when I know that my pool/gym friends ages late 40‘s to mid-80‘s get out of bed, so I need to get up too. When I share my workout routine with friends and family, they often respond by saying “oh I couldn’t do that”. You know, I used to be that person. The thought of getting up early was beyond comprehension. Yet, now that I have done it for nearly a year, I can’t imagine not swimming. The benefits have been greater than just increasing my physical fitness. I am calmer and less stressed. I solve work problems with greater ease. My creativity has increased. Most of all, each day I become a stronger, better version of myself. I don’t share this journey as a way of bragging, because those who interact with me regularly know that I am far from perfect; my journey to healthy living is filled with potholes. I share my story as a way of encouraging others. Perhaps you have been wishing for a way to move more, get physically stronger or learn something new. Personal growth doesn’t have to be expensive. There are free resources available through public libraries, the internet, or by talking to people that you meet as you go about your day. While Tinkering With Success, let’s use this summer to pursue our dreams, enjoy sunrises and sunsets, eat farm fresh foods, interact with people who make us smile, and find moments of solitude when we can reflect on what brings us joy. To refresh your memory, I began taking swim lessons at the local University to learn how to swim freestyle. During the last swim lesson, my regular teacher wasn’t there so another college student was teaching. I was really struggling with my breathing. I had mastered the arms and legs, but could not figure out how to turn my head far enough to get a good, solid breath. I explained the problem to the teacher, she said to focus on turning my hips towards the ceiling, and my head would follow. I gave her the Scooby-Doo, cocked head, “Huh?” sound. ALL of the previous lessons focused on breathing. I learned to blow bubbles. I learned how to turn my head sideways while holding a kickboard. How could focusing on turning my hips help me to breathe? The last I knew, the hipbone wasn’t connected to the nose bone. The teacher encouraged me to “just try it”. She again said, “don’t think about breathing, focus on turning your hips towards the ceiling”. I stood in the lane, stared at the far end of the pool, said out loud “you’ve got this”, and off I went. I took four strokes and on the fifth, I rolled my right hip towards the ceiling. Then my face turned out of the water so I could get some air. It was so simple, that I did it again. And again. And again. I made it all the way to the other end of the pool. Now if you are thinking that I did it with the grace of an Olympic swimmer, you are sadly mistaken. I swam at the speed of a manatee. Each stroke and turn of my hip was slow and deliberate. My breath was accompanied by the sound of me gasping for air. Yet with every movement, I realized that I was SWIMMING. I stood up, looked to the teacher for her effusive praise, and she wasn’t even WATCHING. She was turned away from me talking to the lifeguard. She didn’t even SEE my FIRST 25 yard, freestyle swim. From that point on, she was there at the edge of the pool…watching, coaching and helping me refine my style. Some people wouldn’t have said anything. They would have just let it go, but I was paying her to teach me, not talk to her friend. It was in that moment when I realized how badly I wanted to swim freestyle like the other swimmers do. By the end of the lesson, I swam freestyle, 25 yards, four times in a row, without stopping. I was exhausted, but I did it. I am manatee-slow, but I AM a freestyle SWIMMER. For my entire life I have said “I can’t swim.” In April 2017, I made the decision to learn how to swim freestyle or drown trying. And on the day of my last swim lesson, a college student suggested that I change my focus. My Tinkering With Success ah-ha moment came when I LISTENED and TRIED a NEW APPROACH. In one moment, I went from I can’t, to I CAN. What is the CAN’T in your life that you’d like to turn into a CAN? It doesn’t have to be a big thing like learning how to swim. It could be something small like making piecrust, changing the oil in your car or reading Gone with the Wind. The journey is yours to take. It may not be smooth, but I can tell you that the feeling of success is amazing…at any age. Remember to ask for what you want or need from someone who is on your TEAM, as I did with the student instructor. For me, that extra bit of coaching helped build my confidence. Let me know if you begin your own “From Can’t to Can” journey. I’m happy to cheer you on. I set a swimming goal, worked hard, achieved it. And guess what? I don’t like to swim freestyle. I much prefer swimming the backstroke. It is calming to my brain and I can breathe whenever I want. Yet, I still swim freestyle once a week to keep my skills sharp. I AM a swimmer. I CAN swim freestyle. This recent blog post will focus on my ever-waning observational skills. Perhaps you will be able to relate. I continue to swim five days a week before going to work. To do that, I must have my gym bag filled with lotions, potions and other accoutrements to transform myself from swim rat to working professional. Although carrying my gym bag could be considered a weight-lifting exercise, I do try to scale down the sizes of everything including my hair dryer. Since shampoo and conditioner often come in very large bottles, I transfer the products into travel size containers. About a month ago, I received a notice in the mail that Ulta was having a buy 2 get 1 free sale on my shampoo and conditioner. Being a savvy shopper, I went right out and bought two big bottles of shampoo and one of conditioner. The shampoo label has green writing and the conditioner label is written in blue. I refilled the travel bottles as soon as I arrived back home. The next time I was getting ready for work at the gym, I noticed that the conditioner was a different formula than in the past. It was much thinner in consistency. I really like a conditioner that sticks to my hair, because it helps counteract the effects of the pool chemicals. However, things change so I didn’t think much of it. Each time I used the conditioner at the gym, I would think how much I missed the OLD formula. Then my mind would wander off to other products that have changed over time. I mean what was wrong with 45-rpm records. You stack them up, they all play through, and then the record player turns itself off. Or what about toothpaste? Colgate had one kind at the grocery; you grabbed it and went on your way. Heck, now we need a degree in chemical engineering to know which tube will serve our purpose. But, I digress. This past weekend, I needed to refill my travel containers. I reached into the cupboard and pulled out the shampoo and conditioner. I grabbed the bottle with the green print on the label and refilled the travel container with shampoo. Next I grabbed the bottle with the blue label and as I was about to pour the conditioner, something caught my eye. The word, SHAMPOO. I stopped, put the bottle on the counter and looked at it carefully. Yep it read shampoo. Must be I had mixed up the labels in my mind. So I grabbed the other bottle only to see the word shampoo on it as well. I went to the cupboard to check the third bottle that I picked up on the day of the great Ulta sale and it was the green printed label reading shampoo. For a minute, I just stood there thinking “what the heck?” and then I began laughing. I remember that on the day of the great SALE, I picked up the conditioner and immediately set it back down so I could grab TWO bottles of shampoo. When I went back to pick up the conditioner, I must have accidentally grabbed the blue label bottle of shampoo instead of the conditioner. I didn’t check to see if I had the correct products, I just paid for the items. I didn’t take the time to READ. The conditioner formula had not changed. I was conditioning my hair, for a solid month, with SHAMPOO. Fortunately, I had a different type of conditioner in the closet and put that in my gym bag until I could go shopping. The next time I went swimming, I began reflecting on the shampoo/conditioner saga. I smiled as I remembered the number of times that I had been frustrated by the change in formula. I used that “conditioner” about 20 times before I realized my mistake. Then as my mind often does, I wondered about the other parts of my life where I missed important details that could or would make my life easier. Tinkering With Success is about becoming a better version of oneself. As you can see from this post, I need to get better about noticing details, both small and large. I think that our lives get so busy that, for routine tasks, we often operate on autopilot. We do what we typically do in that same situation. In this case, the outcome was more of a nuisance. It was just a shampoo/conditioner mix-up. This could have been a much more serious error. Thankfully, that was NOT the case. While shopping at the great sale, I remember being distracted by the other shoppers finding their neat bargains. Multitasking is overrated and if you do any research on the topic, you will find that it is not very effective and, in some instances, not possible. As you move through your day, try to bring focus to the task at hand. And the next time you find yourself upset that a product (or circumstance) has changed, be sure it is truly the product and not YOUR version of the “shampoo impersonating conditioner”. For those of you who haven’t followed me from the beginning of this blog, a couple of years ago I learned how to swim the backstroke. Last summer, I joined a local gym and began swimming laps. I’m happy to say that the pool provides great exercise, as well as a bit of humor and a lot of life lessons. Recently, the University where I work sent an email offering swim lessons taught by collegiate swimmers, so I signed up. My goal was to finally learn how to swim freestyle (on my stomach, face in the water). I tried to learn how to swim that way when I was five years old. My Mom would faithfully take me for summer swim lessons and I would sink. I could not float at all. And putting my face in the water was NEVER gonna happen. I remember the day when the guy teaching the lessons said to my Mom, “I can keep taking your money, but she isn’t going to learn how to swim”. Yep, that was the end of my summer swim lessons. Fast forward many years and I am at the University pool at 8:00 am on a Saturday morning. At my first lesson, I was a serious student and tried hard to learn the breathing strategies. The instructor had me and the other students blowing bubbles while holding on to the pool wall. After 15 minutes, we transitioned to holding a kickboard and practicing our breathing while swimming to the other end of the pool. It wasn’t pretty, but I did it. The following Monday, while swimming my usual morning laps, I decided to cut my workout short to practice my breathing and floating face-down in the water. To do that, I moved out of the lap pool and over to the much smaller therapy pool. I thought it might be easier to practice swimming and breathing if the opposite wall was closer. I stood in the water, giving myself a pep talk. “You can do this. The water is only 4 feet deep. There are other people close by. You won’t drown. Now just put your damn face in the water.” So, I took a deep breath, laid my face down gently in the water, and began to blow out bubbles just like they taught me in class. There I am, floating confidently, blowing bubbles in the water, thinking “I’ve got this”. I was feeling quite brave and confident. Now I like to think of myself as a planner, but on this day, I forgot to plan. I did not give ANY thought as to how I would stand up when I ran out of AIR. Freaked out, I quickly tried to get my feet down on the pool bottom. I flapped my arms, tried to roll over on my back, put my face up and gasped for air, only to sink to the bottom of the pool. I did this maneuver several times until my feet finally touched the bottom. When I stood up, I looked over into the lap pool and saw the horrified looks on the faces of the two male pool-walkers. I must have really scared them. I just gave a half smile and said, “I’m trying to learn how to swim freestyle”. They nodded and I slipped down into the water, a bit embarrassed, but mostly I found it humorous. Although the looks on their faces made ME chuckle, I’m certain that it was NOT funny to them. I returned to practicing my breathing while hanging on to the pool wall. I figured that was safer until I could ask someone about how to stand up from the dead man’s float position. Once the two guys left the lap pool, I got out of the water and slipped quietly into the women’s locker room to get ready for work. It’s true, I do have a strange sense of humor, so the flailing pool episode kept me smiling. When I had time to reflect, I realized that my desire to swim was strong, but I needed a plan in place so that my actions did not affect the other swimmers. My Tinkering With Success moment came when I decided it was important to inform the morning pool crew that I was learning how to swim freestyle. That way I wouldn’t scare them and, if I was truly drowning, they would know to come to my assistance. There are many times when we decide to make a life change, but forget to tell those who might be affected by our decision. I’m not saying you and I should ask permission. However, we could inform those who may be affected so, if we do find ourselves flailing as I did, they won’t be scared and may be able to offer aid if needed. A couple of days after I made my last blog post, I was swimming and thought to myself “Wow, warm weather has arrived and I made it through winter without getting a cold or the flu”. I distinctly remember the thought and the genuinely happy feeling that accompanied it. I kid you not, that very next day I came down with the flu, which lasted for a week and then I came down with Bronchitis. I was sick for just about three weeks. While home on medical leave, I reflected back on my thought about not getting sick. I tried to figure out if the thought made me ill or was the thought a warning that I was getting sick. I felt very healthy that day when I was swimming, but the next day I was down for the count. Once able, I returned to the pool. While swimming laps, I found myself wondering if I my thoughts created the illness. Of course my medical friends probably chuckled as they read that previous sentence and proclaimed that I got the flu through contact with an infected person. I do work on a college campus after all. That’s probably a more likely scenario, but I will say that I have been very careful about where I let my mind wander. Visioning is a powerful tool that can be used to help one create a plan, goal, or vision for the future. I have often used it to help me through various stages in my life, such as job changes and personal challenges. The outcomes often moved me forward. Since I got the flu, I have been very intentional when my mind begins to wander off and ask some of those crazy life questions that so often come to me. If negative thought comes to mind, I push it out and replace it with something positive. That’s not always easy, but I do work hard to keep my life moving in a positive direction. Getting sick gave me plenty of time to consider the Tinkering With Success lesson for this blog post. Visioning a positive future for my life is my current focus. Perhaps that is something that you could consider too. Take it from me, thinking positive sure beats coming down with the flu. The daffodils have blossomed in south central Kentucky. In my mind that means spring has sprung. I am excited to begin wearing lighter weight clothes and enjoying outdoor activities. As my journey to being healthy is progressing, I have found two new goals that I want to focus on. The first is that I would like to get strong enough to ride my bicycle again. I missed riding all last year due to broken ankles and recovering from ankle surgery. For me, bike riding is sort of the land equivalent of swimming…it is a feeling of freedom, my mind wanders and I am able to enjoy the scenery. Of course, I have to focus on form and getting up hills, but I find that type of exercise to be very enjoyable. Now keep in mind, I’m not that person dressed in the tight bike shorts and reflective shirt with all of the gadgets for riding a long time. Noooo, I’m the chick in sweats or Capri pants and a t-shirt peddling around as if I have no place to go. I’m not breaking any speed records and climbing hills (which are more like large speed bumps) can be quite the challenge. Riding bike as a grown up reminds me of the days when I would ride with friends during my pre-teen years. No real purpose, it’s just fun. If you haven’t been on a bike lately, I recommend that you try it. Ignore how you look when riding; just enjoy the breeze and the sights. My second goal relates to swimming. Well, not swimming exactly. It’s really more about getting in and out of the pool. I find that I hold onto the handrail with a death grip, so that I won’t fall when going down the stairs. Ascending the stairs, well that requires pulling hard on the handrail as if I’m stuck in quick sand. Now some of you might be thinking, “Boy is she is REALLY out of shape”. OK, I might be, but I have been watching others at the pool and I am not alone when it comes to using the handrail. I saw a woman in her mid-20‘s do the same thing. So my goal, because you know I am a firm believer in goal setting, is to be able to enter and exit the pool with the same grace and ease as Bo Derek running on the beach in the 1979 movie, 10 (find it on YouTube for a visual cue). Now I fully understand that I have never, nor will never, look like that, but I really do think that a similar freedom of movement is possible. While weightlifting, I have been working on both arms and legs. The purpose is to build bone strength so I can minimize the chance of breaking more bones. But hey, is it too much to ask to also be able to use those same muscles to gracefully exit the pool? Tinkering With Success encourages personal growth and my two new goals are bike riding and grace at the pool. As I think about it, bike riding can build leg strength, so maybe, just maybe, by the end of summer, I will hear the crescendo of movie music as I gracefully ascend the stairs at the pool (minus the braided hair with beads). The end of January has arrived. I spent the month focusing on getting healthy to prevent another broken bone. For those of you who didn’t see my last post, I am lifting weights 3 days a week and swimming 5 days a week. My day begins at 4:20 am in order to be at the gym when it opens at 5:00 am. Recently, I was lifting weights and noticed that I was crying. Not the ugly cry, just a couple of tears running down my cheek. I didn’t KNOW that I was sad, so I paused between sets to do an emotional check-in. What I realized was that working out is a LONELY activity. Yes, I was at a gym surrounded by other like-minded people, but I was still lonely. I transitioned to swimming laps in the pool and my mind wandered back to the feeling of loneliness. I realized that although I was not alone, my journey to health was an INDEPENDENT activity. Others could cheer me on, but I had to do the work. I had to wake up, go to the gym, and put in the effort. Several of my friends have been walking their own journey to health for a year or longer. I wrote to one of them and asked if her journey to health was lonely and she said yes. That got me thinking, how many people do we encounter each day that are experiencing loneliness on the journey to health? Lately, social media has been filled with strife. What if we changed the conversation to find ways to help those who are experiencing loneliness. Think about the person who is recovering from illness or someone who is the primary caregiver for an elderly parent, the journeys are different but the loneliness is real. Perhaps we could use our social media time to encourage people who are walking a lonely road. We can’t DO the work for them, but we CAN offer a ray of sunshine on a dark day. It is cold and dark out when I leave home for the drive to the gym. Yet when I arrive at my destination, I am greeted by smiling faces who know the road and who make me see that I’m not the only one on it. My next step in Tinkering With Success is to help someone else see that I am on the road too. I can’t do the work for them, but I do UNDERSTAND the loneliness in the journey. Sometimes understanding is enough. I don’t know about you, but I have this problem with piles of stuff. I’m not talking mountains of trash (although, there was a time…), I’m talking about that pile of miscellaneous items that need to be put away, but you just don’t want to deal with it. The space that used to collect those items was my kitchen table. Once the New Year rolled around I made the decision to keep the table clear. And for the most part, I have been successful. But here’s the thing, when I made the table off limits to dropping items, I just found another place to put them. My new favorite deposit zone is on a chair in the corner of the bedroom. Right now, the pile is quite tall. Of course, I keep the stuff well-balanced so they don’t topple on the dog causing her harm. However, each time I walk in the room, I think to myself “I really should put that stuff away.” I must call it “stuff”, because I only have a vague idea of what’s in that growing mountain. Last weekend I had three days off in a row. I promised myself (yep, you know where this is going) that I would finally clean up that corner. I woke up Saturday morning and decided to meet family for lunch, so I delayed the project until the next day. Sunday was a good day for a nap. And of course, Monday was a holiday and cleaning is NOT a good use of a holiday. When I went to bed Monday night, that darned pile loomed in the darkness. While swimming on Tuesday morning, I was thinking about that pile of stuff and was mentally kicking myself for not cleaning it up. What was the issue? I CAN do it and truthfully, the task will only take about 30 minutes. Then I had a light bulb moment. I have E.D.D., Easily Distracted Disorder. Now some of you might be thinking, don’t you mean ADHD? No, I don’t mean that, because I can stay focused when I WANT to. My E.D.D. looks more like that old Family Circus comic where the little boy wanders all over the neighborhood, when he was only asked to take something to the mailbox. Tinkering With Success is about becoming a better version of oneself. I can tell you that I’ve had piles of “stuff” for my whole life and I’m sure they aren’t going away anytime soon. What I can try to do is to make progress on the bedroom pile, one item at a time. Who knows, I may even find that corner chair again. In the meantime, I know that I’m not the only one with STUFF that needs to be put away. So, the next time you have an attack of E.D.D., know that you are not alone. Recognize your “club” membership, then take just one item and put it away. Progress…it feels good. The New Year arrived with the usual amount of promise and excitement. I took time to reflect on the previous year and decided that I am happy to see 2016 in my rear view mirror. I had a lot of fun, but medical issues and family deaths certainly did take center stage. However, 2017 is here and I am determined to make this my best year yet. Before moving into the plans for this year, let’s recap. Last year I broke a bone in January, healed, then decided to join a gym, which began my adventures in swimming. Yes, I finally found a form of exercise that I loved to do. I wasn’t very good at it, but I was working at getting better. A couple of months into my new found athletic adventures (I can hear some of you chuckling), I broke another bone. Two broken ankle/foot bones in the same year prompted me to have a bone density scan, which the doctor said was “normal for a woman of MY AGE.” Since my bones were healthy, I made an appointment with my regular doctor to find out why they kept breaking. She ran a series of blood tests and called to say that they were all “normal for a woman of my age and WEIGHT. To summarize, I am a healthy woman who easily breaks bones. Confused on how to proceed, I asked my doctor what I could do to stop breaking bones, since walking around in bubble wrap didn’t seem to be a practical solution (although my family did consider bulk ordering the stuff). My doctor is a smart, thoughtful woman. She sat quietly with my question for about a minute and said “there are drugs that can help build bone, but I’m not inclined to go in that direction since your scans were normal.” I looked at her with this expression of hopelessness and before I could speak she said “you need to LIFT WEIGHTS”. There I sat in the doctor’s office, facing the reality that my favorite form of exercise was not a bone-building exercise. Yep, the universe was really having a good laugh this time. Sort of like when you decide to finally focus on eating healthy and the next day a colleague brings a decadent chocolate cake to work. The doctor said I could swim for the cardiovascular exercise, but I must also lift weights. How do I swim AND fit in weight lifting? I mean, I need sleep people. I can get a bit cranky without it. The solution? I decided to get up at 4:20 am, otherwise known as the crap of dawn, so that I could be at the gym when it opens at 5:00 am to lift weights, swim, do my physical therapy exercises in the therapy pool and get to work by 8:00 am. During a recent swim, I was thinking about this major change in my life, trying to find a shortcut. I really do like to sleep and getting up early isn’t fun. There has to be an easier way, right? After tossing that question around for several laps, I concluded that this needs to be my new lifestyle if I want to be healthy and quit breaking bones. This blog, Tinkering With Success, is about becoming a better version of oneself. It appears that 2017 will be the year that I must focus on building bone, which means eating and exercising for health. In the coming year, what do you want to or need to focus on to become a better version of yourself? Do you want to learn a craft, practice singing, cook a soufflé or maybe play cards with friends? Give it some thought and then MAKE IT HAPPEN. Life is too short to be living life covered in bubble wrap. Bring on 2017, we’ve got this! Hello readers. I am happy to report that my broken ankle is healing. The doctor and physical therapist cleared me to begin swimming, so I happily returned to the pool. But before I share some new pool adventures, here’s what I learned while I wasn’t permitted to swim…I missed it. A. Lot. When I was healing, I missed the exercise and the mental clarity that came from being in the water. I always knew that I enjoyed being near water, but when I began swimming regularly, I finally found my favorite form of exercise. Thirty-minutes in the water seemed to fly by compared to 30 minutes on a treadmill. What a blessing to find a form of exercise that brings me joy. I know that many of you found your exercise joy a long time ago, but in this case, I am a VERY late bloomer. For those of you who have been reading this blog from the beginning, you will remember that my first trip to the pool was not smooth. Getting used to pool culture took some time. On December 8th, I returned to the pool. When I walked through the locker room door to the pool deck, I was greeted with hellos and waves from my fellow swimmers and pool walkers. They didn’t question where I had been, they were just happy to see me return. That warmed my heart and helped me to realize that I had been welcomed into the “club” of early morning swimmers. On a recent morning swim, the pool was crowded with pool walkers and lap swimmers. I was swimming the backstroke next to the wall in the 3-ft. deep area . Yes, I still have conversations with myself about breathing and trying to not drown, but I usually feel confident. On this morning, there was a 30ish year old man swimming freestyle right next to me. Several times during the swim, he would splash water on my face, which set me in panic mode…“cough, choke, don’t drown, keep breathing.” Needless to say, swimming that day was not fun for me until that guy finally got out of the pool. Fortunately, the pool wasn’t crowded for the next few days. My lap swimming went well and my ankle was beginning to hurt less. I went to swim the Thursday before Christmas and the pool was nearly empty. I got in my lane and was having a great swim, until I got splashed. I really dislike water in my face. I swim backstroke, because I don’t like having my face in the water. Remember, I have breathing, drowning issues. Anyway, I ignored getting splashed. I figured that guy was back and hoped he wouldn’t swim very long. A couple minutes later I was splashed again. I was frustrated, but tried to be patient. On the next lap, I was splashed in the face again (“cough, choke, don’t drown”). I stopped swimming, stood up to clear out my nose and looked around to see who kept splashing me. In the pool with me was a lap swimmer and a pool walker, both in the far lanes by the opposite pool wall. No one was swimming anywhere close to me. Not one, single human being. I resumed swimming, thinking through the splashing issue and it finally hit me, literally. I was swimming faster than I had in the past and I was splashing my OWN face. I was the person causing water to get up my nose. Hmph! Well I’ll be damned. I did some thinking while continuing to swim, albeit less vigorously. I was the person disrupting my peaceful swim. Did I need to change my technique? Was this part of swimming and would I need to get used to it? I began chuckling at myself (which one CAN do when swimming the backstroke). I remembered how just a few days ago I was so upset with the guy who kept splashing me, when in reality, it was probably ME splashing me. I let those questions sit, without further consideration. However, while swimming laps today I was lost in my daydreams when THIS thought occurred to me: In how many other circumstances do I get in my own way? Think about it, splashing water made it hard for me to breathe and disrupted a peaceful swim. Are there other ways that I am making my life harder than it needs to be? What about you and your life journey? As the new year approaches, people often make resolutions. A quick Google search finds many different articles that say New Year’s resolutions are not always effective strategies for personal improvement. Perhaps a new strategy for Tinkering With Success is to stop making our lives harder than they need to be. Let’s consider the ways that we might be “splashing” ourselves and look for a smoother path. Wishing you (and me) a splash-free 2017. It has been three months since my last blog post. To refresh your memory, I was going to make the last four months of the year memorable. Well, I can honestly say that September was a good month. Although work kept me busy, I could keep up with swimming and began making some healthy changes. One thing that I have learned through living is that as soon as I begin to make a change for the better, the Universe decides to test my resolve. And test me, it did. Mid-October sadly brought the sudden death of a family member. Then while in New York State for the funeral, I fractured my left lateral malleolus (a.k.a. broken ankle). One of those circumstances would be hard enough, both at the same time was truly a struggle. The orthopedic doctor put me in a fiberglass cast and instructed me to be 100% non-weight bearing for one month. That’s hard to do on a good day, but became even more challenging because my sweetheart had to remain in NY to deal with the family member’s estate. I was faced with figuring out how to manage life with broken ankle while still working full-time and taking care of the dog and the house. Thankfully, I broke my left ankle so I could still drive. That resolved the issue of how to get to work. In the middle of a serious “why me?” moment, I remembered my August blog post that challenged me to make the year memorable. I sat down and thought how am I going to meet my obligations while focusing on getting healthy…and make it memorable in a good way? I decided to be patient with myself and to ASK for HELP. My sweetheart was in upstate New York, his emotional plate was full. I needed to keep our home running smoothly so he could focus on the issues at hand, not worrying about me. I looked for ways to get help. I told my neighbor what was happening and she came over to see what I needed. Our daughter and her boyfriend picked up two knee scooters, one for home and one for work. I called to have the garbage picked up at the garage instead of the curb. I hired someone to mow the lawn. My co-workers covered me at the office when I took longer lunch breaks to go home and let the dog out. I made one big pot of food and ate that several days in a row. I used the home office desk chair to move about the kitchen area so I could cook and do laundry. And when the house became dusty, I called Merry Maids and paid them to clean it. After two weeks, my sweetheart returned home. We are a team and having him home certainly made life a lot easier. Through this journey, I realized just how lucky I am. I have friends and family who care, I have supportive co-workers, I have neighbors who watch out for me and, most of all, I have a sweetheart who is there for me. Yep, I am blessed. But what if I didn’t have all those things? If I couldn’t drive, the picture would have looked very different. As Thanksgiving approached, I kept thinking about people who don’t have a support system. How do they manage when life gets complicated? I had a little extra cash so I could hire people to do tasks for me. What if I didn’t have the extra money? Would my friends come to my house to clean it? Would I even ASK them? Two days before Thanksgiving, the doctor removed my fiberglass cast, placed me in an Aircast boot and said that I could begin partial weight-bearing. I felt like I had won the lottery. I have begun the three-week process to walking again and SWIMMING again. Although, the mystery of why my bones break easily has yet to be solved, there is one thing that I know for sure. Helping someone in need “costs” very little, yet can be priceless for the recipient. In October I was reminded that life-altering experiences don’t come with a warning. They come when we are just going about our day. As I prepare for the holidays, I will be noticing the world around me. Who or what might need help, but isn’t willing or able to ask for it? What can I do to ease someone’s burden? And when the holidays are over, how will I continue to be helpful? Tinkering with Success is about becoming a better version of oneself. Being helpful will become a more important aspect of my journey. Perhaps it can become part of your journey too. There are just a couple of days left in August. That means we are close to the December holidays and New Year’s Day 2016 is but a distant memory. Where I live August is hot and humid, it signals the end of summer vacations and children return to school. From my perspective, August is a bummer month. I want more of June and July. I like the fun that summer brings and tend to look for ways to enjoy life a little more. So here we sit at the end of AUGUST. Ugh. What now? It’s still a few weeks away before it is acceptable to pull out the fall decorations and go full-on pumpkin everything. Yet, there must be something to do to pass the time until the leaves change color and the coffee shops bring out the spice drinks. I work in higher education where August signals the start of the new year. It’s a chance to learn new things, do better than last year and to grow professionally. So that got me thinking, maybe the transition from August into September can signal the start of the fourth quarter in my personal life. It can be a time to review the previous eight months of living, ask oneself the hard questions, then make a plan to end the year on an awesome note. Hmm. The hard questions. Is my life where I thought it would be when I looked forward on January 1st? Did I have success with any of my resolutions or plans for the new year? Was the rug ripped out from under my life? Have I been blessed with unexpected joy? When did I say no to something that would have been fun? My hard questions may be different than yours, but take the time to ask them. What could it hurt? You might find some new opportunities for Tinkering With Success. August 2016. I’ll use the final couple of days to reflect on the year, then craft a plan to make the fourth quarter of this year amazing. Now I don’t necessarily mean fireworks and goosebumps amazing, but I do want to make it memorable. On December 31st, I want to look back on 2016 and see that I grew as a human being. And I want to remember the times that I laughed. You know, the kind of laugh that makes you snort and pee a little. Yep, thanks August for reminding me that there’s always time for a fresh start. September, here I come!!! Greetings friendly readers. I bet you thought I forgot about writing my next blog entry. I didn’t forget. I sat down every night to write my next post and then something happened…the Olympics. Yes, I can say with pride (and maybe a bit of embarrassment) that I watched every night and a few days of the Olympics. I watched swimming, gymnastics, shot put, golf, triathlon, running. I watched events that I would never do in real life and wouldn’t even watch if there wasn’t an American gold medal on the line. I cheered for the Americans. I cheered for athletes from countries that I may never get to visit. I listened with interest to the background stories shared by the media. I will admit that there were a few “shake my head” moments such as the green diving pool, the USA Men’s basketball team, NBC covering a lot of fluff stories instead of real news, and Ryan Lochte’s mishap with the police. But even with the “really” moments, I kept on watching. I followed the athletes, felt joy for their families and was proud to be an American. Overall, I was happy to be a human being who could appreciate the talented athletes who gave up a lot to perfect their craft and then share it with me…sitting in my recliner while eating a snack. Don’t judge. Some of you were right there with me. As I watched all those hours of the Olympics, I paid close attention to the swimming. Then I would go to the pool to swim like they do. I tried the back stroke. That was a hoot. I moved faster just floating than I did flinging my arms over my head. Now in my defense, I don’t have an Olympic coach on the sidelines telling me what to do. I am learning by watching the great athletes swim. Sort of like some of you watch the food network or HGTV to become better cooks or home improvement experts. Now I don’t sound so weird, do I? One day while swimming, I was thinking about why I watch the Olympics. Next I began wondering if I could ever win a gold medal. Then that thought drifted off to what would be my event. Finally, as I was watching one of the swim walkers go flying past me, I decided that my Olympic event would be laundry stain removal. Yes, you read that correctly, stain removal. I love a good stain challenge and I will work hard to rid a garment of an unsightly stain. I take pride in getting out a difficult stain. I am on the U.S.A. Olympic Stain Removal Team. Have you seen those soccer uniforms? They need me on their team. Now that I have discovered my Olympic event, what’s yours? In what area of your life have you been Tinkering with Success? We all have gold medal skills. Share those gifts with your corner of the world. You never know when the U.S. Olympic Committee may come knocking. I recently had the pleasure of traveling from Baltimore to Nashville on Southwest Airlines. There were about 60 passengers on the plane so seating was plentiful. After settling into my window seat about eight rows back from the entrance, I pulled out my iPad and connected to the the wifi to watch the Olympics. Let me just say that live TV on a plane is awesome, especially during the Olympics. Like many passengers, I was only halfway listening to the safety instructions given by the Flight Attendant named Josh……until he said that the plane would be going to WASHINGTON. I looked up just in time to see Josh crack a smile and say “oops, Nashville.” That was the beginning of the comedy show called Southwest Air Safety Instructions. At that point, I was laughing. Next up came the instructions on the air masks. I’m still listening to every word. Josh explained that if we were traveling with passengers who need assistance to put on our own masks first before helping someone else. The instructions continued. “If you’re traveling with children, look at each one and determine the child who is most likely to provide you with excellent care in old age, then place the mask on that child first.” Yep, by now I am laughing so hard I am crying. Josh proceeded with additional instructions and I continued to listen. The plane took off at 8:10 pm ET. In flight, Josh was still making the passengers laugh. He came down the aisle taking drink orders. One woman asked for water. He brought her a cup of ice and instructed her to wait a few minutes for the water to appear. The woman looked up, looked back at her cup and looked up again to see Josh smile and then handed her a can of water. When he got to me, I asked for a milkshake. I mean really, he had been making jokes since we got on the plane, so it was my turn to crack a joke. Josh never blinked, he pointed out the window and said “you’ll find it out on the wing.” I laughed, everyone around me laughed, even Josh laughed. Josh was funny. The passengers’ laughter indicated that they enjoyed his comedic talents. But Josh shouldn’t quit his day job, because he has a bigger talent than comedy. He found a way to get 60 tired travelers to listen to the boring safety instructions, just in case we needed the knowledge during an emergency. Tinkering With Success means that I look for ways to improve. Josh reminded me that boring, routine, important tasks can still be fun, even after a long day. So I’m going to look for more ways to have fun while working. The other day I made the morning drive to go swimming. It rained the whole way into town. Once I parked car, the rain poured down even harder. In order for this whole “swim before work” thing to be effective, I have to bring my dress clothes and shower items with me. So walking into the gym, I am usually laden with a stuffed gym bag and dress clothes on a hanger. Again on this particular morning it was raining very hard. In an attempt to use good planning, I whipped out my phone, opened up a web browser and checked the weather app. I thought “ if there is going to be a break in the storm, I can SIT HERE and wait a couple of minutes.” Good planning right? Oh no, my concern wasn’t about the stuff I was carrying, I didn’t want to get MY HAIR WET…..before I went swimming. Yes you read that correctly. I didn’t want to get my hair wet before I went swimming. And here’s the thing, that made perfect sense to me as I sat there checking the weather app. Then after about five seconds (which feels like an hour at 5:30 am), I realized how absurd that plan was and then cracked up laughing. I laughed all the way into the gym, carrying my heavy gym bag, hanger full of dress clothes, all while juggling an umbrella. Yea, that was hiding under my gym bag…on the back seat. I’ll pause the story here until you stop laughing…. While I was swimming, I thought about that silly moment of reasoning. It really did make perfect sense. Most of the time when I am out in a hard rain, I try to avoid getting soaked. I’m sure that lots of people feel the same way. Then I found myself thinking about other times when I made a “plan” only to realize later that it was a bonehead idea. If I’m being honest, that happens to me a lot. After a few laps (remember I am a SLOW swimmer), I concluded that Tinkering With Success is a process and not all of my plans are going to be winners. Some of them are going to be real stinkers. Part of living a full life is being able to laugh at oneself when you find that a plan is flawed, foolhardy or just plain funny. Every day brings moments of struggle. Heck, sometimes the entire day is a struggle. So when you get the urge, laugh. Laugh loud and long. Enjoy it! Even if it happens when you’re sitting alone in a parking lot at 5:30 in the morning. Recently a family member sent me a link to a video that she found on Facebook. I put the link at the bottom of the post so you can see it too. The gist of the video is that a woman wanted to swim with her children, but self-talk prevented her from swimming and from making memories. I could really relate to the video. The post is from a woman’s perspective, however the message is appropriate for both men and women. I bet as you were reading my thoughts you were thinking of your own examples. Why do we do this to ourselves??? Why are we waiting to be a different person, for work to lighten up, for circumstances to change before we do something that we want to do? Now I know that life responsibilities do take the driver’s seat. Imagine this phone call, “Hey boss, I won’t be into work today because I feel like taking a ride on a zip line.” Yea, not good. I have to handle my adult responsibilities so I can pay my rent, buy food and have health insurance. Being a grown up means that we do the right things for ourselves, our family, our employer, our government. But does that mean we can’t also do the things we want to do? Self-talk can be empowering or limiting, it just depends on the conversations that you permit into your thoughts. For me, the empowering conversations are about family and work. The limiting conversations are often about weight and money. I am so thankful that thought bubbles only occur in cartoons. If the people around me could see what I am thinking and how often my thoughts change, they might think “that woman is a bit odd”. My thoughts change so quickly that the popping of the thought bubbles mimic the sounds make by a child playing with bubble wrap. The other day I was swimming (yep still on my back) and my thoughts turned to negative self-talk. I was criticizing my slow speed, poor form and how terrible I look in a swimsuit. As soon as I realized what was going on, I immediately began to focus on my breathing. In. Out. In. Out. In. Out. What happened next was pretty amazing. The thoughts were gone and I was happy to be swimming. The list of things that I will do when I am rich, famous, thin, talented grows daily. After watching the Facebook video, I have decided to begin checking items off that list. And I’m promising myself that when presented with opportunities, I will say yes more often. Since that day in the pool, I have used the breathing technique whenever I needed to clear my thoughts. It has been really helpful. Now I know this is not a new idea. People have been doing this for years. But it is new to ME. As I continue Tinkering With Success, this breathing strategy is becoming the newest skill in my toolkit. So what are you talking yourself out of? When do you need to breathe? Making memories doesn’t always have to be time consuming and expensive. Take a look at your own list, then plan to make a few memories. It is an ordinary sign, one you may have seen in your travels. As any good driver might do, I read the sign and looked ahead for the hill. Now before I tell “the rest of the story” (a nod to Paul Harvey), I must remind you that I grew up in the Finger Lakes region of New York State. We have a lot of good sized hills. Taking your driver’s test meant having to stop while driving up a hill, sit for a few seconds, then resume driving without rolling backwards. On a good weather day, that was an issue. I took my road test during an ice storm. I passed my drivers test, but that HILL was a challenge. 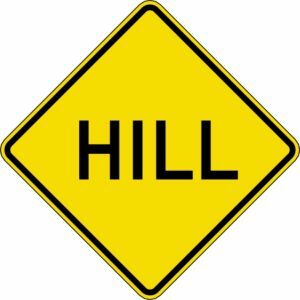 So as I am driving through that beautiful part of Kentucky, I saw the sign that indicated HILL, I looked at the road ahead and found………..…a straight, flat road. OK, to be fair, it had a slight incline, but from the perspective of this native New Yorker, it was not a HILL. As the drive continued I reflected on the sign and my perspective regarding what is and isn’t a HILL. As a matter of fact, I have thought about that sign and my perspective ever since that day. For those of you new to this blog, read the earlier posts and this part of the story will make more sense. Yesterday I went swimming. Again the pool was a bit crowded, but I got in the water and negotiated for a swim lane. Who knew that the skills I learned in Kindergarten would come in handy as a grown up woman in a swimming pool? I began swimming on my back (yep, still can’t freestyle) and focused on my arm movements, breathing, not drowning and trying to swim in a straight line. I really was sober, but I couldn’t swim in a straight line no matter how hard I tried. I kept talking to myself saying “don’t drunk swim”, “follow the lines on the ceiling”. After about 15 minutes, a lane opened up by the long edge of the pool. I moved over and resumed swimming. I could follow the pool wall and swim in a straight line. I began thinking “ I’ve got this”, “I’m doing awesome”. I began to hear noises, my perspective shifted and noticed the two pool walkers a few lanes over. They were chatting and walking at a pretty good pace. I resumed focusing on my swim technique…stroke, breathe, don’t drown. Again I noticed the pool walkers and realized that they were lapping me. For every one length of the pool I swam, they walked 1.5 laps. What the heck??? I was swimming for goodness sake. I am a swimmer, yet I am being lapped by walkers! The HILL came back to mind. The pool walkers saw a slight incline, yet I felt like I was swimming up a HILL. That’s when I reflected that most of life really is a matter of perspective. A HILL to one person may be a slight incline to another. As I finished out my swim, I decided that I need to become more aware of the perspectives of others as I continue Tinkering With Success. And I need to be kind as others are considering their own HILL. Hi there, dear reader. I have good news to share. I went swimming and survived. I don’t use the word survived lightly. I mean it seriously. I have such a fear of water that I worry about not being able to save myself if I panic. Oh I know that I could just tread water, but the truth is I can’t. So let’s start at the beginning. I grew up in a community that has a beautiful lake and many country properties had a pond. So water has been a part of my life from the very beginning. As a pre-teen and later as a teenager, there were many times when I was sitting on the outside looking in as my friends would be swimming. And there were times when swimming looked really fun, but drowning while naked didn’t make good sense to me…however I did think twice about joining them on a couple of occasions. About 50 years later (hey, quit doing the math in your head) I decided to take swim lessons again. The University where I worked offered lessons taught by the college swimmers. I bought my swimsuit, goggles and swim cap. One Saturday morning, I happily headed out the door for my first lesson. I was finally going to learn to swim. Here I am, two years later, signing up for yet another gym membership just so I can learn to swim. When I did the membership paperwork, I asked about swim lessons. Why yes they offer them…for children. I guess once you pass the age of eight, society (or the fitness industry) has decided that people are too old to learn, so sit on the sidelines. Not one to be easily deterred, I asked if they ever offered private lessons. Lo and behold they do, 10 lessons for $240. I’m not saying no to the private route, but I’ll try FREE YouTube swim lessons first. Today I arrived at the gym 45 minutes later than my first visit and was happy to find the Cocoon pool only had a three people in it, one-man swimming laps while another man and woman walked laps talking at the top of their lungs. Again, not the serene swimming environment that I was hoping for, but there was plenty of room for me to swim. I waddled over to get my trusty kickboard, left my towel and flip flops on the bench and waddled even faster over to the edge of the pool. Screeeeeech. I stand on the deck of the pool thinking, God please let me get in this water without falling. Clutching my kickboard, I descend the four steps, slowly, carefully, all the while trying to look self-assured (read cool). Once in the water, my trusty kickboard and I “swam” laps. For 30 minutes. I even did a couple laps on my back sans kickboard. It was glorious. While in the pool I found myself critiquing each lap. “You’re going so slow. You can’t swim in a straight line. Hey I don’t think you’re supposed to see your entire foot in the air when swimming on your back, but those red toes look awesome.” I finally said out loud, today is not about going fast or looking perfect. Today is about learning technique, breathing and of course, not drowning. So what did I learn. Breathing is really important. The more air I took into my lungs, the easier it was to float. When I focused on my breathing, all was quiet. My crazy inner dialog turned off. I couldn’t hear the loud talkers. My fear of drowning lessened. The next time I am afraid of (fill in the blank), I will just breathe. Tinkering With Success is a journey to be a little better than I was yesterday. Today I learned to breathe better. And I didn’t drown. "Love this!!! I can picture this scene in my head, but it could ..."
"That would be correct. I need some more seat time before that ..."
"So I guess me asking you to come ride the track on Tuesday ..."
"Very true and so important to share❣👍 "
"Thank you for your thoughts. I do appreciate it. "